In my most recent column, I covered my month-long adventure trying to make a CanoScan LiDE 50 work on my lab's iMacs running Mac OS X 10.5.7 "Leopard". I got a letter from a reader wanting a little more detail on how to use SANE and Snac. I thought that if I wrote a column about my experiences with bringing old scanners back to life, it would answer his question and, perhaps, the questions of others. The first thing to do is to go to the scanner manufacturer's website to see if they have a driver to support your scanner. I managed to get three Epsons (all different models) and a CanoScan 8600 working that way. If the manufacturer has dropped support for the scanner you have (boo! ), you are going to have to try the third party software route. I mentioned VueScan, which is a more than excellent piece of scanning software. It does cost $40, but it might be worth it to you if you need the scanner to be very accurate in color rendition. The next stop in your quest is at SANE. The first thing to do is check to see if your scanner is supported by SANE. (I had an old Microtek scanner that was only supported by SANE in Linux.) If your scanner is supported, go to the version of SANE ported to OS X by Mattias Elert, download all five packages (TWAIN SANE Interface, SANE Preference Pane, SANE backends, libusb, and gettext) in Tiger, Leopard, or Snow Leopard versions, and then see if SANE works with Image Capture. Make sure you configure your scanner brand in the SANE Preference Pane. I could not get this to work with the CanoScan LiDE 50s. 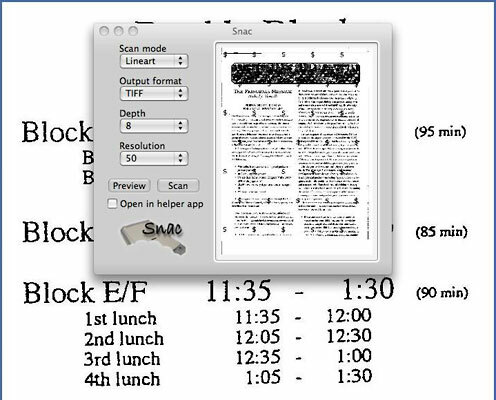 Thanks to a tip at MacForums, I downloaded Snac, a Mac OS X GUI for SANE, from Fredrick Wallner's site. Using the SANE backend and Snac's GUI interface, my scanning problem was over. However, should you go this route, be aware that the Snac interface is very basic and offers none of the bells and whistles that VueScan does. The Snac interface is very basic but functional. You pays your money and makes your choice. The lesson of all this is that persistence pays off - and that the Web is your best resource in solving hardware and software issue. I don't know how it is in other fields, but in recycling computers, it can't be beat. Somebody, somewhere has had the same problem that you now have (or at least a similar one).